Live the surf trip of your dreams. Our website was built to visually represent the "once in a lifetime" surf trips we offer across the world. At Barefoot Surf Travel, we carefully craft surf travel experiences for beginner and intermediate surfers. We offer authentic surf trips to Bali (Indonesia), Ecuador and Nicaragua. We strive to go beyond the typical surf camp, by not only offering high quality surf classes, but also by providing a cultural experience and by exploring each countries top destinations. Our Surf Camps include amazing accommodations near surf beaches and attractions. They also include surf equipment, transportation, activities and passionate surf guides. Our trips run during at the optimal times for surfing and for good weather, in each of our destinations. 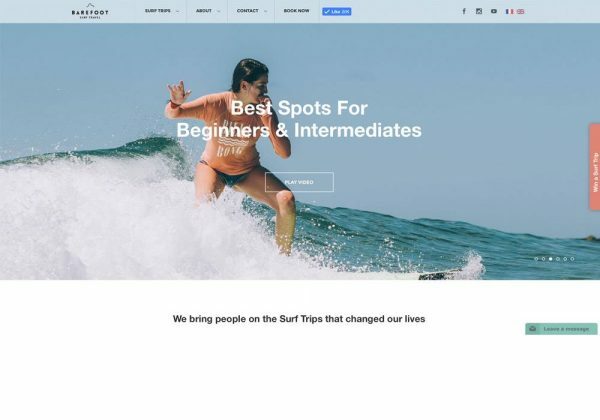 This website was created to represent the surf travel dream: to learn to surf in tropical destinations & ride amazing waves.